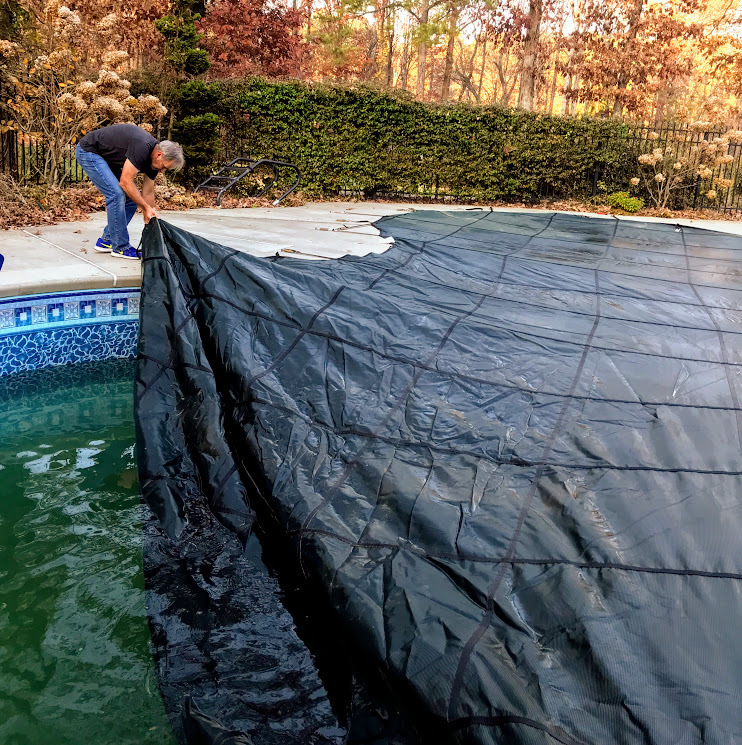 An inground swimming pool cover provides a break from pool ownership - balancing chemicals, removing leaves, and making sure the pump and filter are all working. After 10 years of keeping our pool open through the winter we finally got an inground pool cover. I resisted installing an inground swimming pool cover for several years - because who can argue what looks better - a beautiful, open pool or a big green cover? 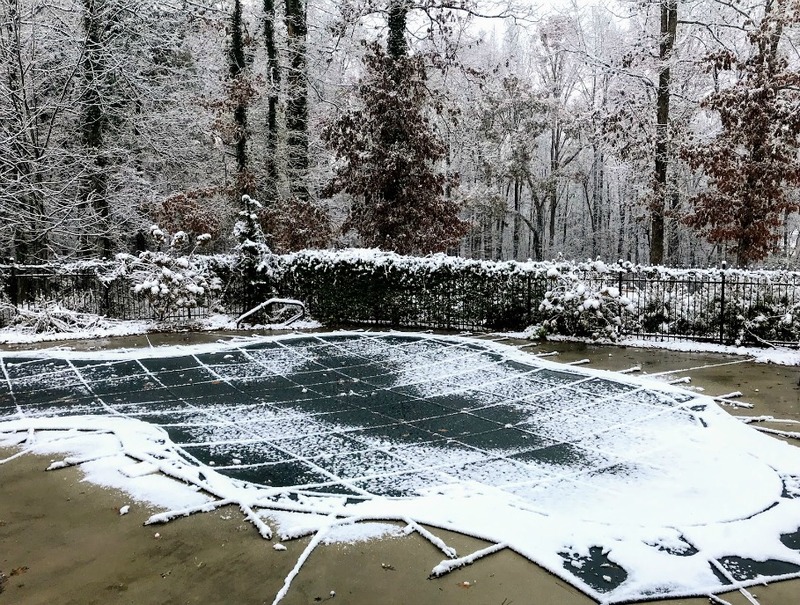 But after several years of regularly cleaning out leaves and debris from icy pool water in the dead of winter, a winter pool cover finally became appealing. As you can see we had a harsh winter with lots of heavy ice that put some serious weight on the cover. After the ice melted the cover sprang back to a really nice and taught fit. 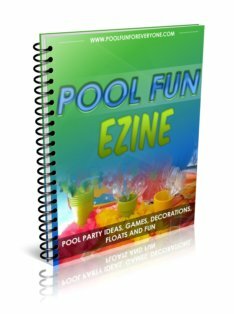 The first step in the process of getting an inground swimming pool cover is to get several estimates. We got 3 different estimates and then checked the references for the one company that we liked the best. 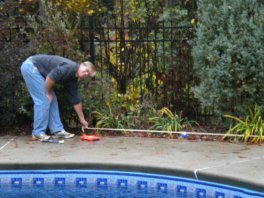 After you decide which pool company to use, the swimming pool needs to be measured. 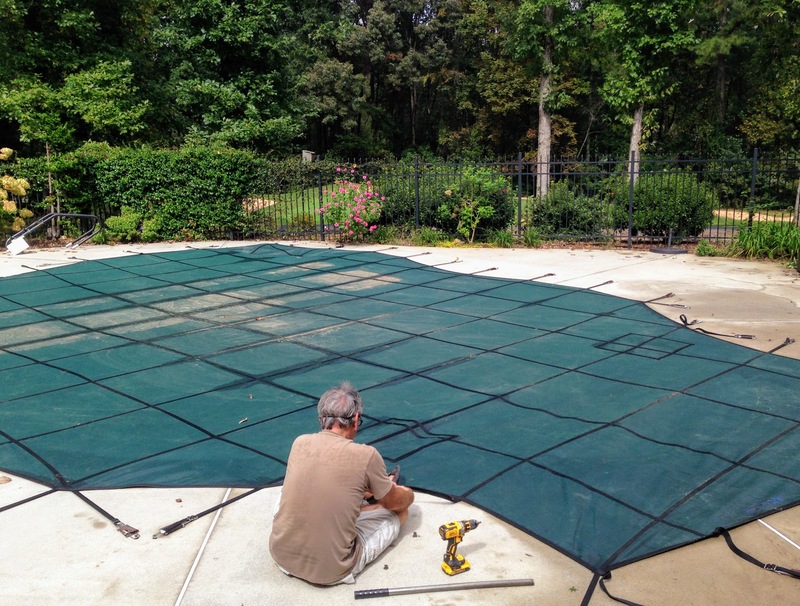 In our case, since we have a free form pool, a custom pool cover needed to be made. It is normal where we live to pay 50% of the estimated cost when placing an order. 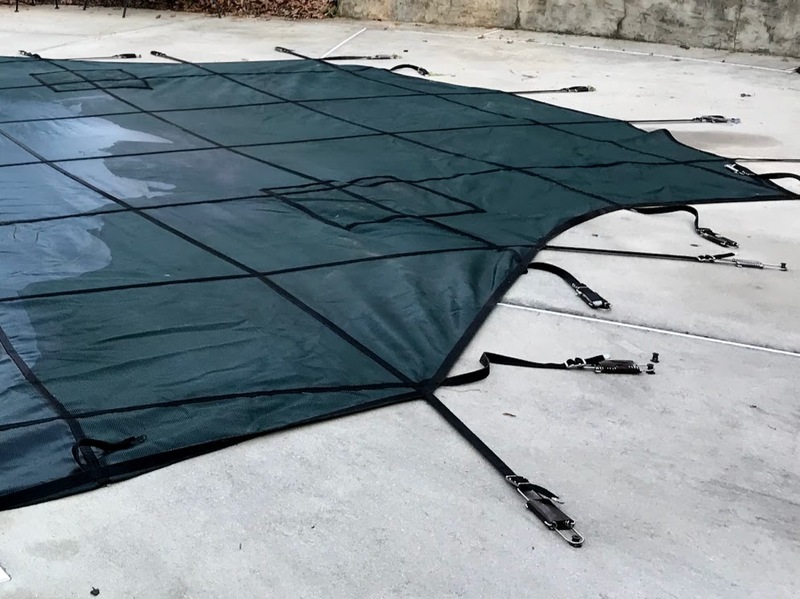 The pool cover is then ordered and around a week later it is delivered. For different reasons, we chose to go with a mesh cover that provides a 99% UV block. 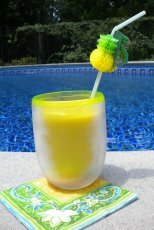 The mesh cover weighs less than a solid cover, it costs less, and the one we purchased is also considered a safety cover. December or early January. However, we do know that when the leaves start falling is when we want to get our pool covered to eliminate the daily need to clean them out. The pool cover that we chose is made by Cover LOGIX. 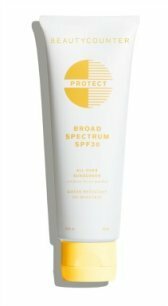 The SunGuard mesh offers the latest technology of combining a lightweight cover that also filters out 99% of the sunlight. Many other mesh covers do offer a 95% blockage of UV light and so I asked our installer what's the big deal - only 4% difference. Well, when it comes to algae, I guess it can tell. With a 99% UV block there is no algae growth while the cover is on and the water should look clean and clear in the spring. 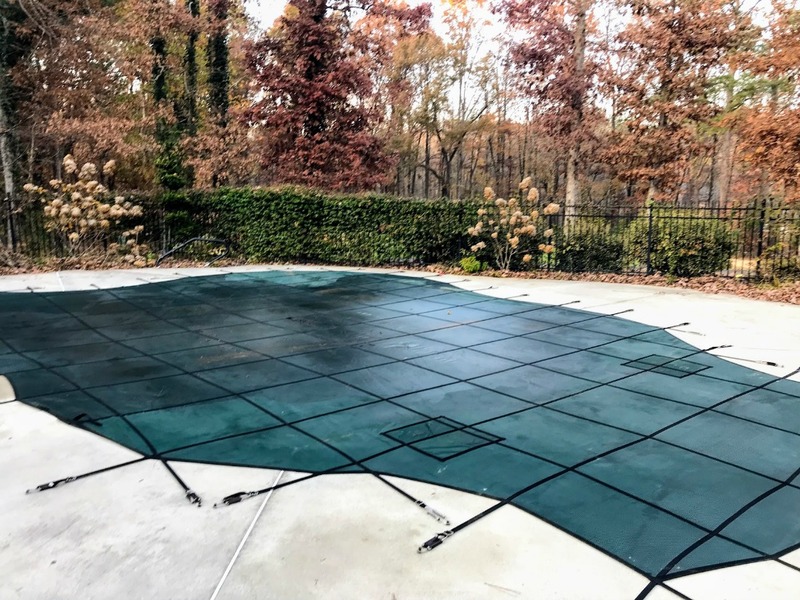 Finally, the inground swimming pool cover has been layed out completely, with the buckets holding the cover in place until the hardware can be installed. For different reasons, it was December 1st when the mesh pool cover was installed, and the air and water were really cold. The heavy duty straps are triple stitched on the top and the bottom for durability. The anchors are made of brass and the springs are made of stainless steel. As you can see these springs have a double-tension - meaning two springs instead of one. The durable straps and springs keep the cover taught so it doesn't droop in the middle. 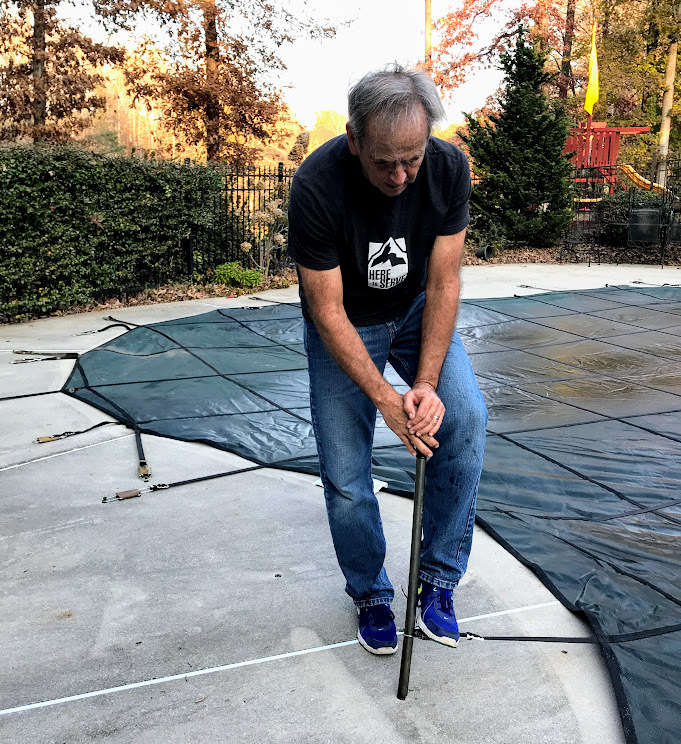 Once the pool cover is in the right position and all of the straps are laid out, Kent uses a really BIG drill bit to drill holes into the cement for the brass anchors. For just a brief moment, we considered ordering our pool cover on line and installing it ourselves. But we were concerned about a couple of things. One was providing an accurate measurement since we have a free form pool and the other was drilling the holes into the cement. The holes are permanent. It's not like making a hole in a wall to hang a picture. These holes are there for good. As you can see it takes some muscle and a piece of special equipment to get the straps nice and tight. 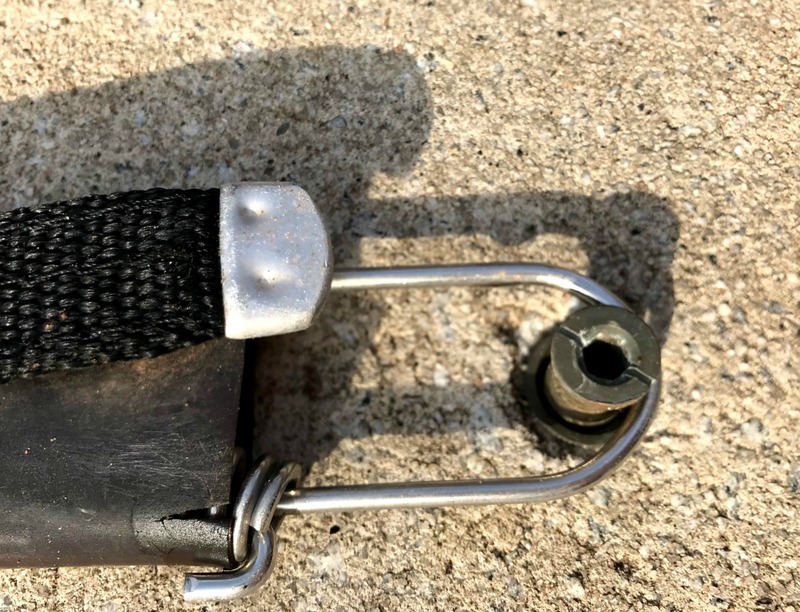 A Metal Spring Installation and Removal Tool is necessary for removing and or covering your pool each fall and spring. As my husband goes around to each strap the pool cover starts to tighten and gets nice and taught. Here is the finished look of our mesh pool cover. Although we have owned a pool for over 10 years, this is the first time that we decided to put on a pool cover for the winter months. Kent blew the lines and winterized the pool so that everything is turned off. The look of an open pool is definitely much more visually appealing, but the reduced maintenance will be worth it. The last couple of nights have dropped below freezing, and in the past we had to always make sure the freeze protector turned the pump on, make sure the baskets were emptied of leaves (not a pleasant job in January), and the pool cleaner was emptied. I think we're going to enjoy a break from pool maintenance during these winter months. 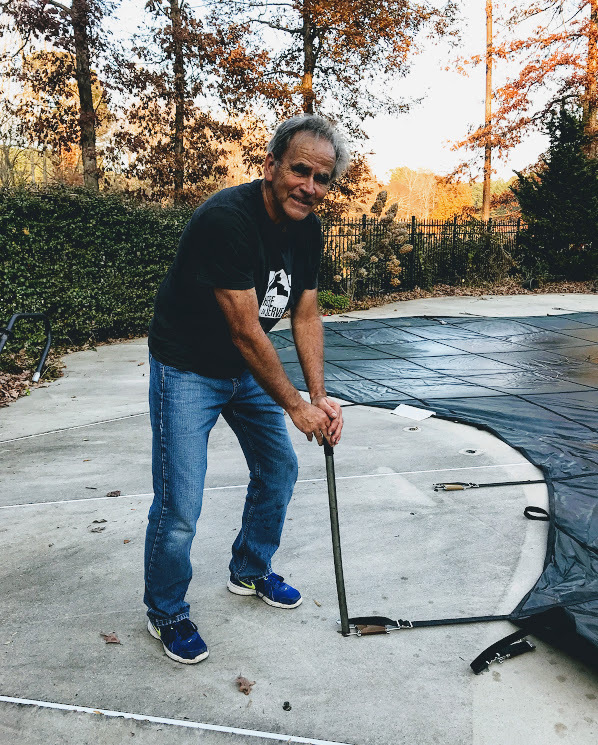 The size of our winter pool cover requires the help of two people - my husband and I are able to do it ourselves. We loosen the anchors on the deep end and pull the cover towards the shallow end. Once we pull the cover off the pool we hose it off to get off dirt, pollen and debris and let it dry before folding it up. It's really heavy so we get it into our wheel barrow and wheel it to the garage to store for the summer.